FOUR-WAY ENTRY PALLET IS USUALLY 40"W x 48"L.
Improved pump performance combines with a 2-year pump warranty, making this one of the most reliable trucks on the market. Double sealed hydraulic pump has automatic pressure bypass when forks are fully raised. Fingertip loop handle control lets you raise, lower and hold forks with ease. Forks include entry and exit rollers and adjustable push rods. Load and steer wheels have sealed ball bearings for easy maneuverability. Hard chrome-plated pump piston. 7"W forks. 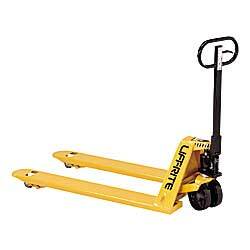 3" load rollers and 8" polyurethane steer wheels include sealed ball bearings for smooth rollability. 210° steering arc. SPECIFY FORK SIZE: B - 20-1/2"W x 36"L, C - 20-1/2"W x 42"L, D - 20-1/2"W x 48"L, F - 27"W x 36"L, G - 27"W x 42"L, H - 27"W x 48"L. H - 27"W x 48"L IS IN STOCK. Others FOB WISCONSIN. EXTRA HEAVY-DUTY 10,000-LB. CAPACITY TRUCK. 7"W heavy-duty structural steel forks feature solid steel push rods for extra strength. 8" steel steer and 3-1/2" load wheels. 180° steering arc. Other custom-made sizes available, call for information. FACTORY QUICK SHIPFOB WISCONSIN. 5,000-lb. capacity. 8" polyurethane steer and 1-3/4" steel load wheels. 6" wide forks. 210° steering arc. FACTORY QUICK SHIPFOB WISCONSIN. For XV-17305,500-lb. capacity truck only. FOB WISCONSIN. XV-1730B 20-1/2" x 36"	 20-1/2 x 36"	 170	 37-3/4"
XV-1730C 20-1/2" x 42"	 20-1/2 x 42"	 170	 37-3/4"
XV-1730D 20-1/2" x 48"	 20-1/2 x 48"	 170	 37-3/4"
XV-1730F 27" x 36"	 27 x 36"	 170	 37-3/4"
XV-1730G 27" x 42"	 27 x 42"	 170	 37-3/4"
XV-1730H 27" x 48"	 27 x 48"	 170	 37-3/4"
NOTE: Special sizes, brakes, skid adapters, tandem rollers, and other options available. XV-1732H 400	 27 x 48"	 3-1/28"
XA-1733 33 x 48"	 200	 1-3/46-1/2"
Base pallet truck for custom sizes.